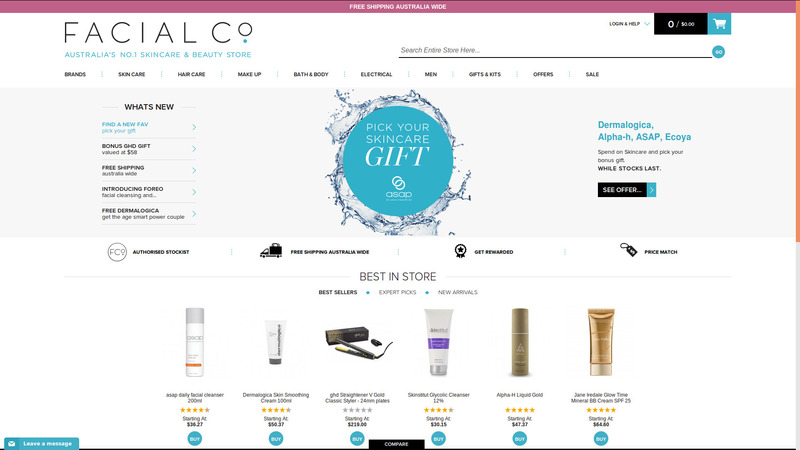 Facial.co is an Australian owned company that sells quality skin care products and offers expert skincare advice to customers in Australia and around the world. Located in Brisbane, Facial Company delivers high quality skin care products to customers all over the world. The product range of FacialCo.com.au contains also hair care, sun care, makeup & fragrance. You can shop by skin type or by brand. Facial Company believes that a healthy balance between price, service and value is paramount. They provide a range of exclusive services to online shoppers including online skin analysis. So you don’t have to go to a dermatologist to check your skin but can make it from your home. We believe that’s a really good service. We have 11 active Coupons, Deals & Promos to save with Facial Co.
Use FacialCo coupon code provided at CouponDeals.com.au. Shop While Supplies Last! Use our FacialCo. promotional code. Shop While Supplies Last! Grab our promotional code. While Supplies last only. Use Facial Co. Code provided. Shop While Supplies Last only! Free Asap Essential Duo with orders $99+ at FacialCo! Shop While Stock Lasts! Receive Redken Diamond Oil with orders $119+ at FacialCo! Shop While Stock Lasts! Limited Time Offer! Receive a Bag of Beauty with purchase over $129 at FacialCo! Use Code provided here. Shop While Supplies Last! Receive Cupid’s Kit with any $149+ purchase at FacialCo! Use Code LOVEDUP. Shop While Supplies Last! Free Dermalogica Retinol Power Couple when you spend $149+ Sitewide at FacialCo! Use Code provided. Limited time offer. Terms apply. Shop beauty & skincare! Free asap Refining Duo when you spend $79+ on skincare at FacialCo! Use Code provided. Limited time offer & quantities. Ends 30/1/17. Shop now! Click ‘Get Coupon Code’ and copy the code shown to your clipboard as described. You’ll get re-directed straight to Facial Co.. In the store, add over $99 worth of product to your cart. Add Deal Code where it says Promotional Code in your cart. Enjoy your Gorgeous Gift Pack! Free Bonus Beauty Sampler with Davines, Wella, Nak, Juuce, Pureology orders $79+ at FacialCo! Exclusions Apply. Use Facial Co. coupon code provided here. Shop While Supplies Last! Use Code provided. Shop While Supplies Last! Free Gift ($58 value) with purchase of any GHD Styler at FacialCo! Shop While Supplies Last!